There is no doubt that caregiving is a stressful, emotionally charged responsibility filled with conflicting emotions. The emotional stress of caring for persons who are aging, chronically ill, or disabled can be debilitating for family members as well as professional caregivers. Grief is universal to the human condition, but it is especially prevalent in aging populations and those who care for them. The experience of aging is replete with loss: loss of function, loss of roles, loss of visibility in popular culture. The experience of caregivers is also one of loss: loss of characteristics of their loved one, loss of freedom, loss of social support. That loss is a part of aging is not a new concept, but surprisingly the conceptualization of these losses as in the context of grief is. Historically, most theories of grief have focused on the process of grieving a fixed loss: someone dies and those who remain must process that person’s passing. This is not true for caregivers, who often experience the loss of their loved ones little by little, while simultaneously processing their own losses associated with the process of aging. Increasing evidence demonstrates that the death of a loved one after years of caregiving is not the impetus for grief, but rather the losses in function, roles, and other aspects of personhood and relationships during the process that begin, prolong, and often complicate the grieving. The concept of grief as a process is a relatively modern idea. Many of the currently aging population and their caregivers were not raised with the concept of grief as we now know it. While they were exposed to loss and know of it as a “fact of life,” many of them are not aware of the common symptoms and experiences of grief. They are often unaware of the nature of grieving, thinking its primary component is sadness. Edward John Mostyn Bowlby (1961) was one of the pioneers who examined the psychological process of mourning. He defined four stages of mourning, each with characteristic symptoms and consequences if the grieving person is not able to work through them. Shock and numbness, where the loss does not yet feel “real,” emotionally or cognitively. People may very well experience symptoms during this stage, but they tend to be more physical in nature (fatigue, loss of sleep). People who are not able to move through shock and numbness may not be able to accept their loss and may shut down emotionally. Yearning and searching, where the loss is acutely felt and people search for something to fill the void or provide comfort. People who are unable to process through the phase may spend years trying to compensate for the loss. Despair and disorganization, where the loss is accepted and a sense of despair bordering on hopelessness causes people to question if they will ever feel better, or be able to recover and have a normal return to life. Those who are unable to process through this phase may continue to feel despair, anger, and/or depression that will cause a persistent negative outlook on life. Reorganization and recovery, where despite the loss, life begins to be restored. People establish new ways of living and new beliefs about the future. This is a stage characterized by both acceptance and rebuilding. In Bowlby’s (1961) conceptualization of mourning, during this stage, people are able to focus more on other emotions and experiences, rather than the grief they have been coping with. It was Bowlby’s initial study of grief that provided the inspiration and foundation for the more familiar stages of grief later established by Elizabeth Kubler-Ross (1969): Denial, Anger, Bargaining, Depression, and Acceptance. Similar to Bowlby’s conceptualization, each of these stages of grief is thought to follow a linear process, have characteristic features consistent with its name, and have consequences for failure to process through them. Kubler-Ross’s stages of grief have been modified in recent years to include an initial shock phase and a testing phase before acceptance, but the conceptualization remains the same: a linear process with fixed goals and eventual recovery. Where these theories provide relevant information that often resonates with the experiences of grieving persons, they do not adequately account for the grieving process that those who love and care for them experience. For caregivers, there is no fixed point in time where a loss occurs. Rather, they face the daily experience of processing grief associated with loss of partnership and companionship, loss of freedom, and loss of roles, while still holding on to the pieces of independent function and character that remain in their loved one. Ernest Dimnet, a French priest and author of the book The Art of Thinking, famously quoted, “The happiness of most people is not ruined by great catastrophes or fatal errors, but by the repetition of slowly destructive little things.” This is the truth of experience for people with progressive illness and their caregivers. Caregiving has traditionally been considered an obligation that has been defined as difficult, mainly for the burdens of time, financial, and physical abilities it entails. It has not been historically conceptualized as an ongoing process of grief, however, research on the experiences of caregivers has consistently demonstrated that symptoms that were previously considered aspects of fatigue associated with the roles of caregiving are actually more consistent with the experience of grieving conceptualized by psychologists like Bowlby and Kubler-Ross. According to Waldrop (2007), caregivers often express significant negative thoughts, emotions, and physiological responses associated with their experiences that are common aspects of the grieving process. These include regret, guilt, despair, anger, loneliness, loss of roles, fatigue, crying, agitation, cognitive difficulties, and a sense of things being “unreal.” Meuser and Marwit (2001) define caregiver grief as the cognitive, emotional, and existential aspects of the constantly changing demands of care and anticipation of outcomes. When working with older persons and their caregivers, professionals will inevitably witness aspects of grief of which caregivers are unaware. This lack of awareness can lead to an internalized sense of confusion, depression, and often sense of guilt and shame associated with the experience. This often manifests in statements like, “I’m just so tired all the time. I feel numb, sad, guilty, angry, resentful.” The knowledge of grief, and the ability to name and articulate its experience is a valuable tool for any professional who works with these populations and their caregivers. This gentle aspect of rapport building and support has the ability to stabilize internal experience and redirect emotions that could lead to personal shame, guilt, and depression. It is important to note that caregiving is not a unilaterally bad experience. It is also associated with positive feelings, like the ability to be present for the last moments of a loved person’s life, a sense of satisfaction, and comfort with the care being provided, However, incorporating its potentially detrimental impact is a newer development in the fields of fostering healthy coping with chronic conditions and caregiver support. Models of caregiver grief especially are being developed and studied to understand and intervene in the caregiver’s experience. Two of these models are the Relief Model and the Complicated Model (Waldrop 2007). The Relief Model focuses on the resolution of stress resulting from the eventual death of the care-receiver. It also incorporates aspects of the longer trajectory of care, such as the time to prepare for the eventual loss, and changes in roles and responsibilities. Those caregivers who experience relief often begin to resume previous activities or roles. However, they may struggle with a sense of guilt at anticipating their loved one’s death while trying to balance the relief associated with knowing their loved one is no longer suffering. The Complicated Model demonstrates how elevated levels of distress associated with caregiving can become more complex after the death of the care-receiver. 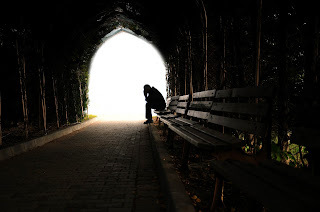 The losses and levels of stress incurred while caregiving and failure to acknowledge or grieve these losses can lead to great difficulty in the post-death bereavement phase. These caregivers have great difficulty finding closure and resolving grief while finding a method of reintegrating into life following loss. They often struggled greatly with their role as a caregiver while simultaneously not understanding how to have another role in the loss of the care receiver. Both of these models demonstrate that even when experiencing a sense of relief, there are still difficulties in coping with and processing the experience of being a caregiver. Professionals can aid in the healthy process and coping with loss that comes with caregiving, especially for those who are moving in the trajectory of the complicated model. According to Mullan (1992), the perceptions that caregivers have about their caregiving experience, and the way they grieve while their loved ones are still living, significantly impact the way they will adjust to the loss of a loved one after death. One does not have to be a psychologist to intervene at any stage of the mourning, grief, sadness, and difficulty that caregivers experience. Even the most subtle intervention of listening and acknowledging another person’s experience can significantly impact its outcome. The first step to helping anyone is assessing his or her needs. Assessment of grief and caregiver burden requires a holistic approach, encompassing the biological (fatigue, problems with sleep), social (changes in family dynamics, personal roles), psychological (sadness, anxiety), and spiritual nature (death anxiety) of a person’s experience. When asking questions, it is valuable to prompt for answers in all of these categories. Each person experiences grief and stress in different ways. Where one may feel more psychological effects, another may feel more social and physical burden. It may seem simple, but the act of stating one’s thoughts, feelings, and physical sensations out loud is a profoundly impactful psychological intervention. It is the foundation of a principle called mindfulness (the ability to be fully present in the here and now) that enhances coping and acceptance. There are many ways to provide comfort to someone who is experiencing grief. • Educate caregivers and those they care for on the nature of grief and how it is a response to all forms of loss, not just death. • Discuss how grief is an ongoing process that may contain themes like shock, anger, sadness, confusion. They do not necessarily follow a perfect order toward resolution. One of the beneficial effects of educating is a process psychologists call normalization, where someone begins to understand that for something to be so well studied and talked about, it must be common. Never underestimate the power of helping a person to feel like he or she is not alone. Also, never underestimate the power of “bearing witness” to someone’s grief. We live in a world of platitudes. Sometimes the greatest gift you can offer is an honest conversation and genuine listening. All of us will experience grief at multiple points in our lives. Most people will progress through grief naturally to some form of resolution. When people have difficulty in grief, it is usually the result of getting stuck somewhere in their process, as discovered by Bowlby and Kohlberg in their research. Part of what we do when we educate and listen to clients is to help them move forward with the process of grief, to “un-stick” themselves. In addition to fostering process, it is also important to know about the resources available for people who are experiencing grief, and the additional burdens of being caregivers. There are many excellent websites (see Resources) that offer comprehensive education, information, and peer-support networks for caregivers. They often touch on the losses and experience of grief, and they can connect caregivers to other people with similar experiences. Local hospitals, churches, and community centers often have grief support groups and additional opportunities for people to connect with others in similar circumstances. Responding to grief is not usually considered an explicit aspect of the provision of professional services for aging populations and their caregivers, outside of those whose jobs are defined by such support (pastoral care, therapists). Caregivers may be more likely to give details of their experience in passing and to the professional contacts in their lives: sharing concerns about taking adequate care of their spouse to a financial advisor, expressions of guilt or remorse to a doctor. Many professionals have likely had clients share emotional and often taxing details of their lives. Having knowledge of the experience of grief and sharing its normalcy, giving their experience a name and a cause outside of themselves, can be a significant and impactful compliment to any professional service offered clients and their caregivers. Every professional is capable of assessing, listening, providing comfort and resources to clients who are experiencing grief and caregiver fatigue. In many cases, they can serve as a guide toward the relief model and away from the complicated model of caregiver grief. It also serves as a bridge to potential resources to aid in coping with grief and caregiver burden, and enhances the level of rapport, trust, and knowledge of client needs in a professional relationship. Carilyn Ellis is a Fellow at the Boise VA Medical Center, specializing in oncology, palliative care, and primary care psychology. She completed her doctorate in clinical psychology at George Fox University in Newberg, Oregon. She loves serving those who serve our country, and especially working with Veterans. She can be reached at cellisalaska@yahoo.com. Caregiver Grief: Recognizing and Addressing the Symptoms was recently published in the Winter 2015 edition of the CSA Journal.